In a cattle industry first, Swiss tag manufacturer Datamars has announced it will be offering a lifetime retention guarantee on its NLIS (National Livestock Identification System) Triangular “Tough Tag” from July 2011. This announcment comes off the back of the recent news that a traceability system will become an integral part of any decision to re-open the Live Export trade, as well as the ongoing scepticism on the long-term loss rates of NLIS cattle tags. According to Datamars Livestock Manager, Mr Tim Scott, this decision is aimed at putting certainty back into the supply chain. “The cattle industry is crying out for someone to be accountable for what they do. In the [cattle] traceability business, I know our design and manufacturing capability are second to none. We have legitimately done trials and we know the long-term results are outstanding. Getting cattle producers to actively request better products from their reseller however means we have to put our money where our mouth is”, says Scott. 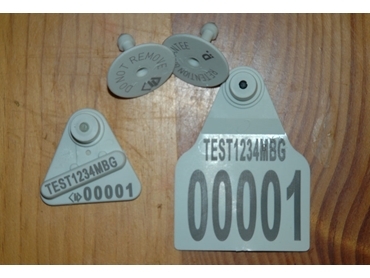 At no additional charge, all Datamars Triangular NLIS cattle tags will be supplied with a medium or large matching management tag and button printed with the same code and serial number as the NLIS tag, which will have a “Retention Guarantee”. Extra-large tags are also available at an additional cost and extra lines of printing on most tags is a free option. If an NLIS cattle tag is lost, and the matching management tag remains in place, Datamars simply replaces the lost cattle tag. With questions being raised about the legitimacy of some NLIS cattle tag trials in recent years, Datamars challenging other suppliers to improve their quality to help the NLIS become a true lifetime traceability system. According to Scott, the “Tough Tag” is yet to have a substantiated retention complaint and over five years of official Australian trials across a spectrum of production systems has yielded negligible losses. “The wound aeration aspect is the key to our low loss rates, so with the round tags, we wouldn’t feel safe offering this type of absurdity across all regions of Australia,” continues Scott. The guarantee is only being offered with our triangular [cattle] tags, the guarantee only applies to orders in excess of 100 tags and to claim the cattle must not have moved to other PIC’s or have different owners. Full conditions are available on the Datamars website.